Holy cow, a chapter released in the same year as the previous one! I’m rather proud of myself 😉 Just a short one today; I had been going to combine this chapter and the next but it would have been ridiculously long so I decided to split it to make life easier for myself, and to try and get an update published in the same month as the last one was. I failed on that front technically as it’s 42 minutes into October, but I was nearly there! 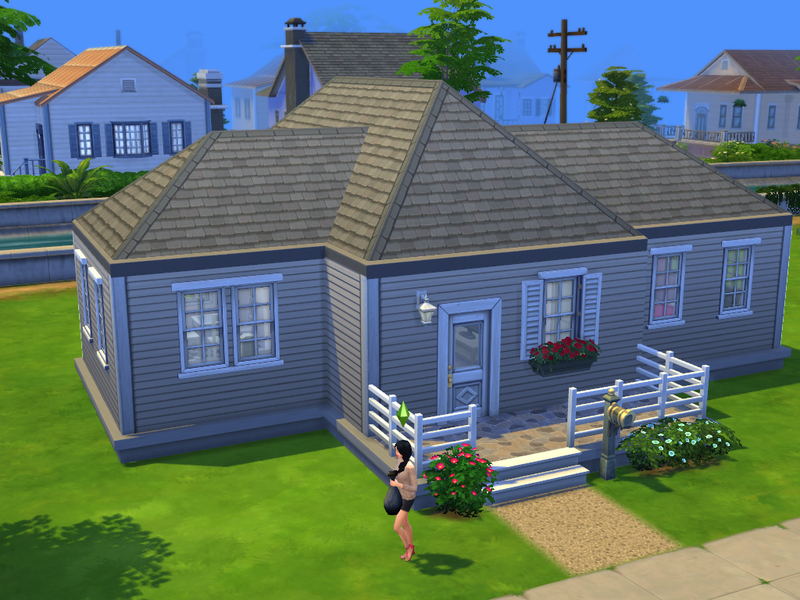 Just wanted to share a couple of pictures of the house I built for Lily and Freya. It’s nothing massively exciting as I’m a fairly rubbish builder, but I’m currently binge-watching The Sim Supply’s Youtube channel hoping to pick up a few tips to help me improve! 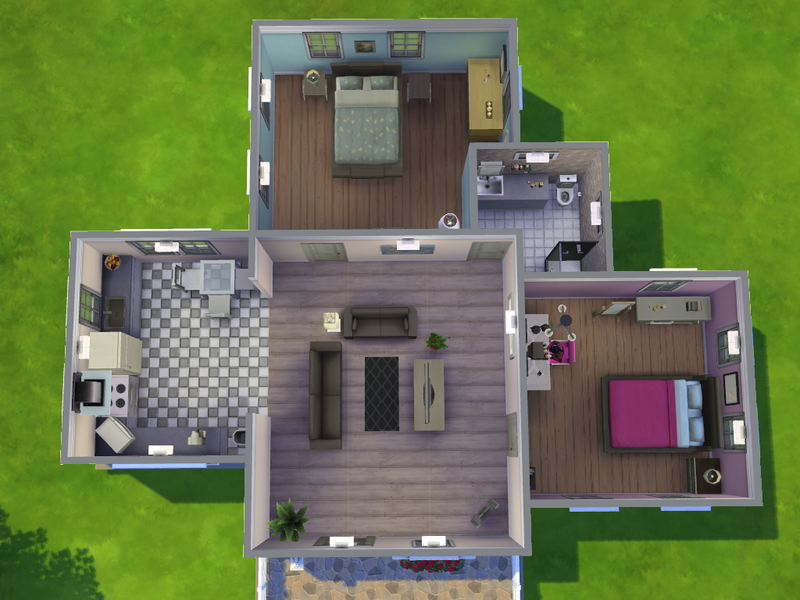 Freya’s bedroom is the one on the right, and Lily’s is at the top. If you want me to share this house and the girls to the gallery then please let me know and I’ll sort all that out properly! As you may have noticed I’ve had a little change about with the design of the blog. It’s still the same template but I’ve just played about with the layout and colour scheme, so I’d appreciate a bit of feedback. Also, I’ve decided that at the end of chapter 40 I’m going to be having an heir poll, so get your thinking caps on guys! I can’t focus on both twins for the whole generation and should they both have kids I won’t be able to choose which one should continue the legacy, so I’ve decided to let you guys decide for me! Great chapter! I love both Freya and Lily… I don’t know if I’m going to be able to pick between the 2..! Yay! Awesome chapter…once again. 🙂 I must admit I am in love with Freya’s character and really want to see where things go with her and Aidan. I know she’s got a few more masterpieces left in her still. And Lily’s great, too, but J. Huntington III…not so much. Your Sims references, especially Humans, cracked me up. So funny. Loved it! Thank you! I’m pleased you enjoyed it 🙂 Hahaha, glad the references were appreciated! Can never decide if they’re too cheesy etc, so always good to know they’re going down well! I swear I nearly cried laughing at Aidan playing “Humans” on the computer at the library! Too funny! I love your sense of humour in your chapters and how your Sims always say “oh gnomes!” lol, classic comedy! I loved seeing some of the townies in this chapter. I think EA did a pretty good job on the premades this time, I’ve yet to see a truly horrifying premade Sim. I’m glad Lily found a hunky guy at the gym but I’m pretty sure J has the noncommittal trait so proceed with extreme caution, Lily! As usual, a wonderful chapter. I was so excited to see an update! Thanks! I’m so pleased you enjoyed it 🙂 I agree about the premades, compared to the Sims of Twinbrook they’re a massive improvement!! Thanks for reading and for commenting, as ever 🙂 Means a lot Ashleigh!! No problem, Sian! Your stories are brilliant, I’ve always been a huge fan of you and everything you write. Could you upload them to the gallery if you haven’t done already? What’s your origin name? I recently found your blog – and read the whole story about the Rivers family. I was having a very long Sims break, but I was really glad when I saw that your last post is pretty recent and that you are planning to continue.